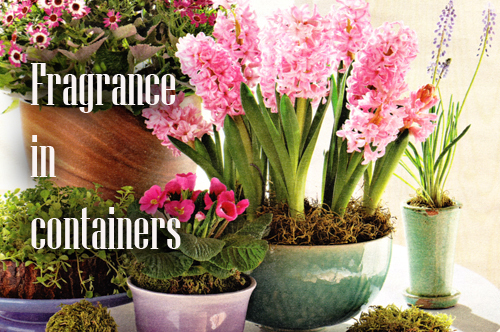 Gardening in containers is easy, and allows you to bring lovely fragrances up close, whether in a window box, hanging basket or pots on the front porch. 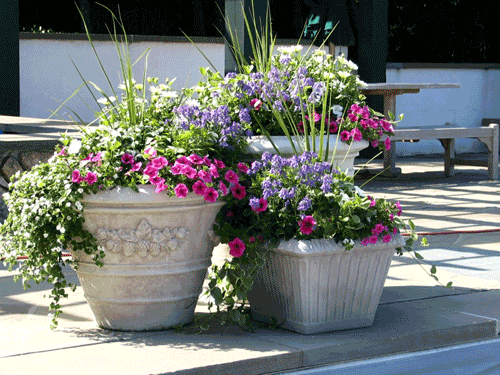 How about a wonderful aromatic garden pot large potted plants on your deck or patio? 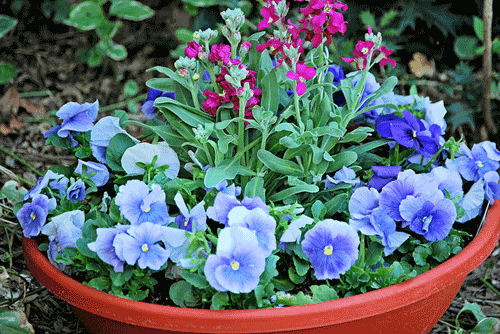 Annuals, perennials, and a few shrubs and bulbs provide strong fragrance and grow well in garden pots. Here is a sample of plants you can fill your containers with that are unfussy and very fragrant. Nothing left to do but sit back reap the compliments on your gardening success. Scented Geraniums - they grow for their leaves rather than the flowers and are best handled as pot grown perennials left outdoors in summer and kept indoors when temps drop below freezing. Use a herb set like the photo show and a number of different species. Many gardeners enjoy collecting these under demanding plants with fragrances that include rose, mint, lemon and even chocolate. 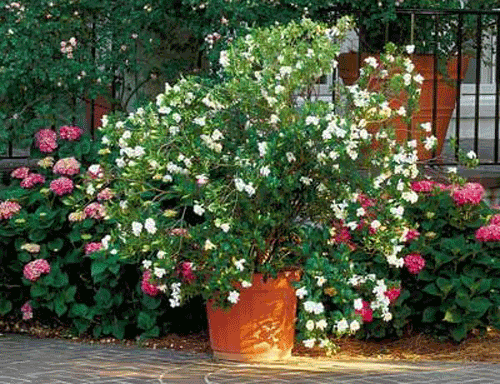 The do best in pots placed in full sun in spring and 50 percent sun in summer. Water them regularly and fertilize from spring to autumn. Gardenias - is one of the most fragrant plants on earth. It is a tropical shrub that serves well as a summer patio plant, but it needs a cool place to spend winter - indoors. The best time to grow them is in early summer. Water lightly during winter when the plants are indoors. We love this potted plant and the fragrance is heavenly. Bulbs - Plant fragrance hyacinths and paper white narcissus in pots in the fall. Dampen well, the place the pots in a cold place for at least 6 weeks. Like a garage or under a stairwell in the basement. Move the pots indoors in late winter, and treat them as sun lovoing houseplants until they flower. A quick list of some good smelling plants to pot are: Flowering tobacco, Heliptrope, lilac, Sweet Alyssum, petunia, stock and pinks. All are lovely in color and style and the fragrances are wonderful and potent. It is also fun to combine fast growing annual flowers in 14" garden pots creating fragrant bouquets. Put taller plants toward the center of the large pot and place smaller plants surrounding them plus add trailing plants toward the edges to create a delightful look. Include more plants than you would in similar space in the ground. Read more.....Create your own Japanese Garden.